Google Buys FeedBurner -- It's Official! Congrats to Chicago-based feed management and advertising company FeedBurner for getting acquired by Google. The rumor that started a few weeks ago has been confirmed by FeedBurner today (June 1, 2007). There are more details on Google/FeedBurner deal here. In addition, they are just a great group of people. Being from Chicago, and I have the opportunity to get to know FeedBurner and just about all of their 30+ employees through either work or play in the last few years. 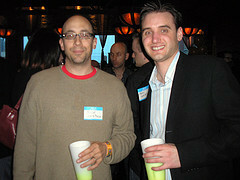 FeedBurner was a big supporter of TECH cocktail, as Eric Olson works at FeedBurner and co-founded the event with me in 2006. They have been an innovator in both the feed management/metrics and advertising space.